A rendering of the Queen City Landing project on Buffalo’s Outer Harbor. 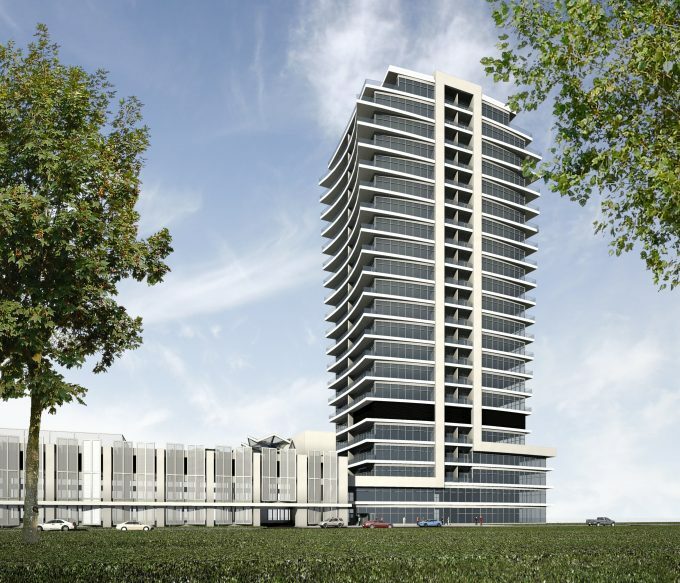 The Buffalo Planning Board on Monday gave a conditional approval to a request by the owner of Queen City Landing on the Outer Harbor to divide the 20-acre peninsula property into two parcels, creating the possibility of future construction on the western portion. Gerald Buchheit wanted to split the property at 975 Fuhrmann Blvd. into an eastern half, with 8.8 acres, and a western half, with 11.2 acres. The smaller portion is the site for his planned 23-story apartment tower, which was already approved by the Planning Board last year, but the western half is vacant. Buchheit has talked of future plans for that area, but not in the near term. The board's approval was conditional on the outcome of a legal battle that surrounds the Queen City Landing proposal. Four local residents filed a pair of lawsuits against the city last year, contending that officials improperly approved the project, a modification to it and the initial plan for subdividing the site. A judge initially ruled in favor of Buchheit on the first lawsuit, but the case is now pending before the state Appellate Division in Rochester, with a hearing scheduled for April 12. The second suit is on hold until the court rules on the first one, which is expected to come by early summer, said attorney Marc Romanowski. That could hold up construction. The Orchard Park developer has already demolished the former Freezer Queen building on the site, and crews are now working on the environmental cleanup. That's expected to last into the early summer, delaying the start of construction from Buchheit's original April timetable.